At Lincoln Park 2550, you know what you’re in for the moment you walk through the building’s front doors. The lobby alone is full of panache, with a beautiful, elegant design that welcome residents every day. Plus, enjoy the security of a 24-hour doorman, the convenience of concierge service and a number of recreational amenities as well. Enjoy time with family or friends in the 20-set movie theater, Recharge in the full fitness center, or relax in the steam room, sauna, indoor lap pool or Jacuzzi. Frolic with your little ones—on two or four legs—in the tot lot or dog exercise area. Lincoln Park 2550 also offers outdoor space that just for its residents in the form of a stunning ¼-acre park. With lush, impeccable landscaping, a large, private garden, and plenty of room to walk and play, it’s an urban oasis for any season. 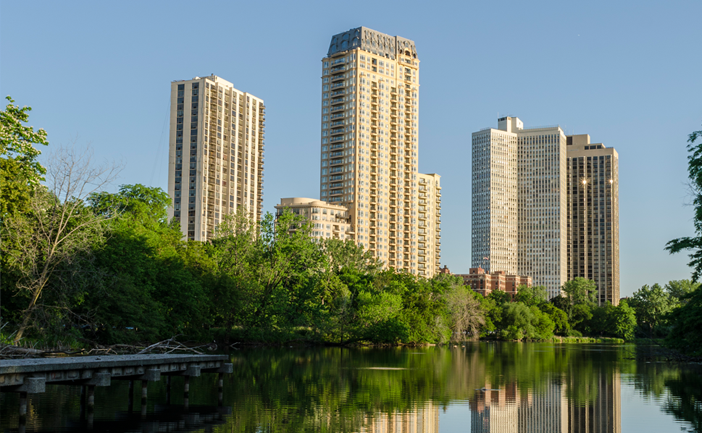 Living here also puts you literally in Lincoln Park proper, just steps from sprawling greens and activities like the Lincoln Park Zoo, conservatory, and North Pond. Designed by Lucien Lagrange, Lincoln Park 2550 is elegant down to every detail. Lagrange’s European-inspired aesthetic is seen in a number of famous Chicago buildings, all of which are known for retaining their value in real estate. The building offers a wide range of floorplans for luxury living, from 900 square-foot 1-bedroom units up to a generous 8,500 square foot condos.